Race director Jim Aughney joins us to talk through the best prep, what to expect on the day and the best recovery techniques once the race is over. The race director suggests plenty of water whatever the temperature on Sunday. ARE YOU RUNNING the Dublin marathon this Sunday? We chatted to race director, Jim Aughney, who has overseen the marathon since 1997, about the race itself and what to expect. We also put readers’ questions to him on the best ways to fuel your body and what to do after the race to keep the legs going. 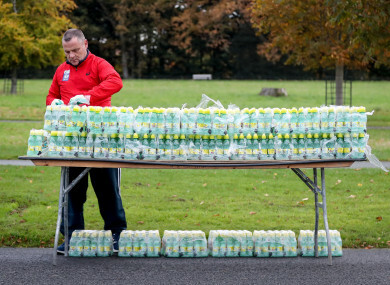 Email “'Don't experiment on race day' - Planning your final preparations for the Dublin Marathon”. Feedback on “'Don't experiment on race day' - Planning your final preparations for the Dublin Marathon”.